The rotator cuff is a group of four muscles with a common tendon that helps to stabilize the shoulder by keeping the head of the humerus stabilized in the socket (glenoid) throughout the arc of motion. The rotator cuff provides translational (sliding) and rotational (twisting) stability and power to the shoulder and is critical for normal shoulder function. With time, life, and age, our shoulders’ rotator cuffs undergo repetitive stress and strain, small and large traumatic injuries, and a decrease in the blood supply and oxygen delivery to the tendon. As this happens, the molecular mechanisms responsible for repairing the damage that results from these issues are less effective. Hundreds of proteins are responsible for these processes that take place in thousands of complex interactions. The American Shoulder & Elbow Surgeons, the Orthopaedic Research & Education Foundation, and the National Institutes of Health supports a growing body of high-quality basic science and clinical research that is helping surgeons better understand why rotator cuff tears happen and how to best treat them. It’s critical for patients and surgeons to approach rotator cuff disease from a biological perspective and this is why rehabilitation from rotator cuff surgery must be thoughtful, focused, patient-centered, and precise. Patients and surgeons must collaborate and work together in a partnership to have the best results. When patients engage and commit to the rehabilitation protocol, they give themselves the best possible chances for an optimal outcome. Torn rotator cuff tendon under repair with suture anchors in-place. 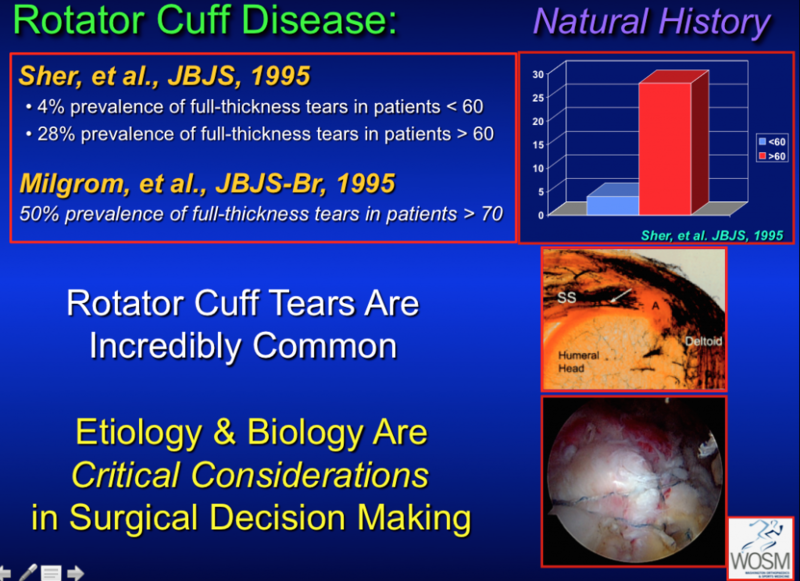 The natural history of rotator cuff disease shows us that full-thickness or complete tears are relatively rare under the age of 60–65 years old and become increasingly common over the age of 65–80. Determining the cause and chronicity of the rotator cuff tear can be challenging and relies upon a thorough history and physical examination which is then evaluated in the context of appropriate diagnostic imaging (x-ray, MRI, and Ultrasound or CT-Scan arthrogram). For tears that require or would benefit from rotator cuff surgery, contemporary repair techniques and the growing body of scientific research has significantly enhanced the ability of surgeons to optimally care for their patients. We have transitioned from an era of in-patient, open rotator cuff repairs with general anesthesia, significant post-operative pain, and vague instructions for physical therapists to a dramatically different experience for patients. In 2015, rotator cuff repair is a routine arthroscopic, outpatient surgical procedure with a regional or combined anesthesia that has substantially less pain, less muscle trauma, and progressively better results. The technological advances in medical devices have radically transformed the ease with which the procedure is performed using a high-definition video arthroscopic camera through one of three to five incisions that are less than a centimeter in length. The size and composition of the implants as well as the material strength and function of the suture material has enabled surgeons to provide better care for patients and achieve better results. Despite all of these incredibly exciting achievements, the most important component of a patient’s outcome from surgery is the design, implementation, and adherence to a rehabilitation program. Rotator cuffs, and all tendons of the body, have intrinsically poor blood supply. For over ten years, Dr. Rudzki has been focused on the role of blood supply in the development of rotator cuff disease and its influence on surgical repair. Tendons require less oxygen than muscle because they serve as ropes or cables that connect muscle to bone and act passively. The actions and forces generated around joints come from the muscles of the body that require large amounts of oxygen (and therefore blood supply). As a result, tendons are low-priority for blood supply and oxygen and are more susceptible to traumatic tearing, degenerative changes, repetitive stress and strain, and decreased ability to heal. Some day, we may be able to intervene and manipulate these factors biologically. At present, we have to understand them and respect their profound influence on tendon healing after surgical repair. To do this, we place patients in a sling for approximately six weeks after surgery in neutral rotation where their forearm rests more at their side than over their stomach. This “gunslinger” position (similar to John Wayne in an old Western movie) is supported by a pillow that reduces tension on the surgically repaired tendon. Patients come out of the sling once or twice a day to gently bend and straighten the elbow and participate in simple passive exercises that reduce shoulder stiffness and discomfort without stressing the repair. 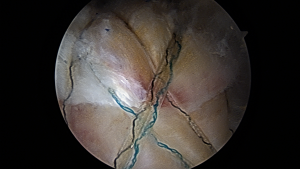 When a rotator cuff is arthroscopically repaired, it takes approximately 12 weeks for the repair site to begin to have structural integrity as new blood vessels form and the tendon-to-bone repair site continues to mature. Collagen from the tendon adheres to bone in a sub-optimal fashion in comparison to the native tendon-bone connections we are born with. That collagen adhesion begins with a poorly organized scaffold that matures over time. If stressed too soon through aggressive early active motion, the repair will fail. Numerous studies have looked at this in vitro, in animal studies, and in clinical outcome studies. The conclusions based on the best scientific evidence to date are simple: we have to respect the biology of the repair and the challenges of obtaining tendon-bone healing. As a result, we avoid anti-inflammatories for the first four weeks after rotator cuff repair when data suggests that inflammation is important to help the tendon heal. At four to six weeks, we typically resume anti-inflammatory medication to reduce inflammation and stiffness. Stiffness is always a concern of shoulder surgeons because stiffness increases soreness and is typically uncomfortable for the shoulder. However, we have learned over time that if we focus too much on concerns of stiffness, and do not protect the surgically repaired tendon, then we are going to have higher failure rates and poorer outcomes. As a result, rehabilitation protocols after rotator cuff surgery are designed to protect and maximize repair-site integrity while trying to reduce the risk of post-operative stiffness. Several researchers have examined this paradigm in-detail and have helped us to develop protocols based on the best-available evidence. Adhering to these protocols is challenging, and often frustrating, for patients because it interferes with several aspects of daily life and comfort. However, the cost and risk of non-adherence requires that we focus on the goal of surgery: to obtain the best possible functional outcome for every shoulder we treat. The current body of best-available evidence supports the concept that protecting the repair leads to minimal risk of long-term stiffness and optimizes the chance of not only tendon healing but enhanced functional outcome. After six weeks, the repair is continuing to heal yet prolonged immobilization is less desirable because the risk of stiffness increases. 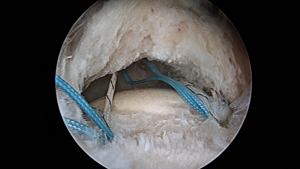 As a result, at six weeks most patients are weaned from the sling and placed into a motion restoration protocol with specific limitations of activities and lifting to minimize the risk of damage or strain to the healing tendon. Between weeks 6-12, many patients will have stiffness of the shoulder and soreness that is a normal part of the healing process. Research data from Dr. George Murrell of Sydney, Australia has demonstrated that patients with stiffness during this time period have a more favorable chance of healing and therefore should not find this discouraging. 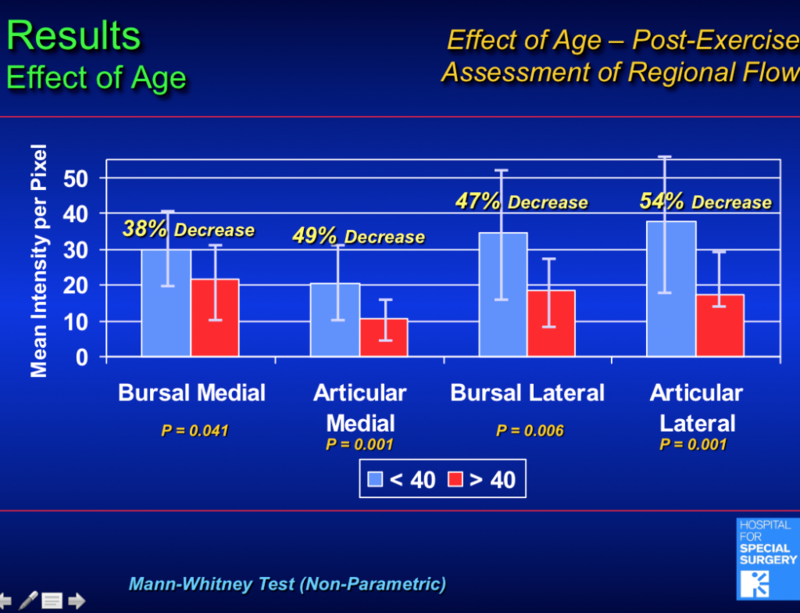 By 12-14 weeks, most patients have regained the majority of their passive motion and begin gentle strengthening that progresses over the next three months. By six to nine months, most patients are typically ready to return to golf, tennis, kayaking, swimming, and other desired activities but several factors influence the results. 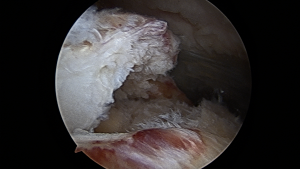 Tendon tissue quality, tear size and chronicity (acute vs chronic tear), patient age, smoking status, diabetes, and a host of other factors can significantly impact the results of arthroscopic rotator cuff repair. Discussing these with your surgeon and understanding how they will influence your rehabilitation is essential. For further information on rotator cuff disease, visit Dr. Rudzki and the fellowship-trained, board-certified specialists of Washington Orthopaedics & Sports Medicine. Make sure to follow WOSM on Facebook and Twitter. Dr. Jonas R. Rudzki is a board-certified, fellowship-trained orthopaedic surgeon specializing in sports medicine and conditions and injuries of the shoulder, knee, and elbow. 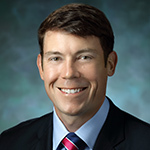 In addition to serving as an attending surgeon at WOSM since 2006, he is one of the few select shoulder surgeons in the Washington, DC area to be admitted to the American Shoulder & Elbow Surgeons society. Dr. Rudzki carries a Certificate of Added Qualification in Sports Medicine from the American Board of Orthopaedic Surgery and has served as a clinical associate professor in the Department of Orthopaedic Surgery at The George Washington University School of Medicine and on the Evaluation Committee and Board of Councilors of the American Academy of Orthopaedic Surgeons (AAOS).